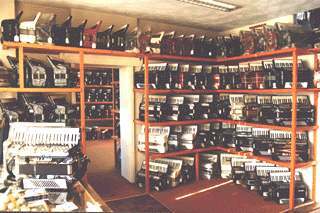 We really do have one of the largest stock of accordions in the world! In fact, we pride ourselves on offering the biggest selection at all times, of new and secondhand instruments anywhere in the UK! I want my customers to see and try as many instruments as they can, before they purchase and take away the one they have selected as right for them. This page will take you anywhere you wish to go within the Allodi Accordions Website. The Allodi Accordions Website is informative and fun to use. 72 bass instruments will be listed for you, (new and secondhand), along with the option to see a full size image. The same applies to all categories. All pages offer the link back to the index/home page. Check it out for yourselves by clicking on the appropriate button above. No charge for checking it over and/or providing a typed estimate. Depending on the instrument itself of course, there is virtually nothing that cannot be repaired, although in some instances, it may not be financially sound to do so; either way, pop along to the shop with your accordion, and I will give you the full benefit of my expertise. You can telephone by all means, as many enquiries can be dealt with by phone if you know the make and model etc. details of the instrument concerned, however, occasionally it will be necessary to see the instrument before an accurate estimate could be provided. how to care for your instrument page. If you would like some personal background on the business and it's origins, you might like to go to our family history page where there are lots of pictures, some even older than me! 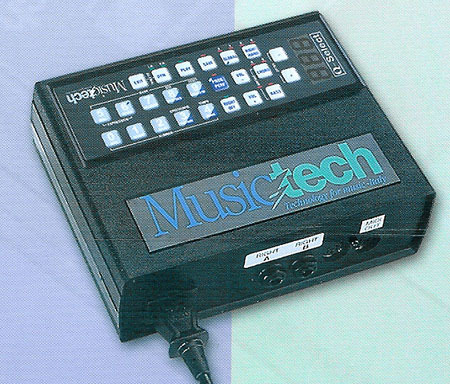 An 'easy to use' MIDI which transmits on 4 channels; for the accordionist who wants to add MIDI, without getting involved in too much programming. Simple to use, this new interface from Musictech. This provides a revolutionary new solid state contact system which eliminates all the noisy and false contact problems caused by wear and dirt in a traditional contact system without altering the sensitivity of the keyboard. Size of midi panel shown (left) is approximately 9cms x 4cms and wafer thin. The most suited and versatile accordion MIDI system on the market today. Same characteristics as the Q Select grill mounted but with external control box. Important: - The fitted prices shown above are Musictech's own prices. When ordering a new Italian accordion from us the price may vary as some accordion factories may add a handling charge or commission which is down to the discretion of the factory concerned; generally the prices will be lower. As an example, if you are adding MIDI Q-Link to any Fantini/Allodi accordion the price will be only �750 which is less than the Musictech price shown above. Therefore prices for MIDI to be fitted on new instruments may only be advised upon order of any instrument. The Sennheiser MT 04 Model. This system is the result of 'SENNHEISER' technology and years of professional experience acquire by the MusicTech design team. Linear response from 20 Hz to 20Khz. S/N ratio 58 dB. This amplification is 9 Volt battery powered. Price for kit supply - �375. Fitting from factory �390 or fitted here - �410. The Sennheiser MT 03 Model. This model uses 3 Sennheiser capsules for the right hand ( the same as the MT 04) but none in the bass . Kit supply price - �335. Factory fitted �345 or fitted here �375. The Sennheiser MT 03 D Model. Uses two Sennheiser capsules for the right hand and one for the left hand. This is suitable for diatonic and small accordions. This is fitted externally on the instrument grill. Employs the same Sennheiser capsules as the MT 04 but amplifies only the right hand. The Sennheiser MT 01 Model. Uses one Sennheiser capsule for the left hand. Suitable for diatonics and small traditional accordions. Kit supply price - �170. Factory fitted �175. Installed here �195. ALL PRICES SHOWN INCLUSIVE OF VAT @ 20%. The MT 06 Model. This microphone system is for the right and left hands. A MusicTech "Custom Design" which provides the excellent performance expected by professional accordionists. Linear response from 20 Hz to 20Khz. S/N ratio 58 dB. This amplification is 9 Volt battery powered. Price for supply - �270. Factory fitted �280 or if fitted here �300. Employs the same capsules as the MT 06 but amplifies only the right hand. Kit supply cost �240. Factory fitted �250. Fitted here �270. The MT 05 D Model. This microphone uses two MusicTech "Custom Design" capsules for the right hand and one for the left. Suitable for diatonics and small traditional accordions. The MT 07 D Model. Uses two MusicTech "Custom Design" capsules for the right hand. Suitable for diatonics and small traditional accordions. Kit supply price �230. Factory fitted �240 or fitted here �260. ALL MICROPHONE SYSTEMS ARE AVAILABLE WITH POWER ADAPTOR.